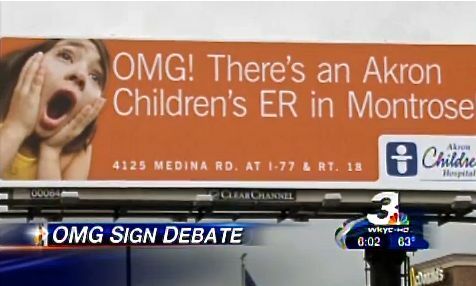 Akron Children’s Hospital has opted to drop “OMG” from future advertising after a few complaints over its new billboard in the Montrose shopping area. The billboard reads “OMG! There’s an Akron Children’s ER in Montrose!” and looks down upon the busy intersection of Route 18 and Cleveland-Massillon Road. Blogger Cindy Orley felt the sign was a slam against God and began writing about it last week. She and her father, a local minister, voiced concerns to Children’s Hospital. Hospital leaders say they meant no disrespect and received few complaints but, nevertheless, they will drop OMG from future advertisements. Christians object civilly when offended, unlike progressives who riot in the streets, vandalize property, steel tvs and beer. I think the entire dust up contrasts sane tax paying Christians, verses progressive freeloading perverts. Its a lesson in civility. Won’t references to God in the public square (e.g. this billboard) offend atheists? OMG stands for “Oh my God!” Wouldn’t an atheist hate to refer to God whom he or she views as imaginary as his or her God? Just saying. 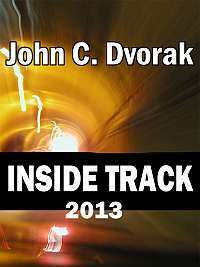 #27 I, personally, try to avoid language that debases others people’s beliefs and values, even if I don’t share them. That’s because you can’t bend over fast enough for every dickhead on the daisy chain. I suppose that the minister and company will want to go back to stoning people when they use the name of Jehovah. I guess the new revival in American Christianity is orthodox Judaism. Won’t references to God in the public square (e.g. this billboard) offend atheists? Would “Oh my Zeus!” offend you? No? What about “Oh my Santa Claus!” or “Oh my Sheeba!”? Exclamations to a fictional character do not offend atheists. Rather we treat it as rather comical as the billboard was supposed to have been treated. Why is this ao hard to understand. Christians only like their references to God on public buildings like courthouses or on their money. They don’t want a picture of a girl thanking God for her good fortune of having local hospital on their highways. Would have thought the “God Freaks” would appreciate the free publicity ? Should have added a trailing s. Then it would be Vishnu’s problem. No government entity forced them to change the sign. A “somewhat” free market dictated the change through consumer voice opinion. That still qualifies as a Free World. It is only when the government forces the change, ala Howard Stern’s fines on terrestrial radio, that meets your sarcastic criteria. Unitarian Universalist Church shooting was political, not religiously motivated. Third, no Christian church with more than 20 attendees (read cult) advocates violence as a method for arguing against abortion. You have a point, for now. Many of the people who would complain would also like such restrictions to have the force of law. For our own good. I admit reaching a bit here. I couldn’t find reference to his religious beliefs, but given that hes a conservative in East TN, its a pretty safe bet. The motivation is not relevant, if he’s a christian who perpetrated violence the point stands. I don’t think that is universally true, but even with that as a given its irrelevant. They are still Christians who perpetrate violence. My point here is not to malign christians. TeaDud has made this argument before, that the right or christians are never responsible for any violence or misbehavior, but that all bad acts are the fault of the left. These are but a few examples that refute that claim. When will these jesus junkies learn to leave everyone else alone? Thanks to the American (Anti)Family Association, I did something yesterday that I almost *never* do – bought ice cream. Ben & Jerry’s Schweddy Balls ice cream, to be exact. All this “it’s offensive!” stuff is going to backfire. Better to grow a pair and accept the fact that we do not live in a theocracy. It already is back firing. Law suits against the 10 commandments, “in god we trust,” and prayer in schools is that backlash. Unfortunately it feeds their martyr complex, and they cry about how “persecuted” they are. It does insult to historical Christians that they even use that word given the scope of their influence and freedom. Bad Behavior has blocked 13720 access attempts in the last 7 days.